Grab your friends, some white-on-white running gear and get ready to be painted. At every kilometer, runners are spritzed with a new color of paint by volunteers, spectators and staff members to indicate how far they’ve made it in the race. Also known as the “happiest 5k on the planet,” The Color Run is now the largest event series in the world. And, most participants are new to 5k runs, so this is a good choice if you haven’t trained for a race before. Race through the Most Magical Place on Earth dressed as your favorite Disney character to make all your childhood dreams come true. Over the course of one weekend, partake in magical family fun with one or more of seven races. The crowning event, the Walt Disney World Marathon, is a 26.2 mile run that takes participants through all four theme parks. In the world’s largest obstacle race series, participants must conquer what is known as the Battleground, which covers miles of rugged terrain and 12 extreme obstacles. Then, racers can head to the post-race party to feast on turkey legs, sip from beer steins and listen to live music. This is the perfect race for thrill-seekers, dare-devils and anyone up for intense challenges. Winning isn’t always about coming in first place — at least not with Tough Mudder. This team-oriented race offers word-class, fun obstacles you can’t find anywhere else. And, it’s more than a fitness challenge: Participants value camaraderie and the experience more than rankings. Although the Undie Run is pretty short in the world of running events, you may not want to be out in your skivvies too long in February. Don your best bedroom attire and hit the streets to run, walk or dance around with hundreds of other half-naked participants. If you aren’t comfortable flaunting your goodies, help with fundraising and earn yourself some cool Cupid merch to show your support. You’ve been prepping for the impending zombie apocalypse, right? Continue your training with the 5k Zombie Run. For this run, you can participate as a human and try to navigate your way to the “Safe Zone” with at least one life flag remaining. Or, if you have a hunger for brains, join the race as a zombie — complete with makeover — and walk, crawl or hobble through the course trying to steal the humans’s flags with only two functional limbs. Although chasing is not allowed, scaring is always encouraged. 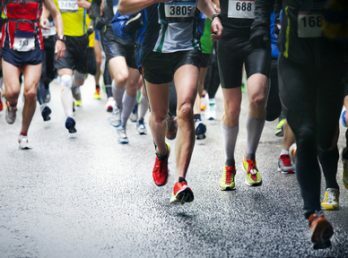 Participating in a fun run isn’t just good for your health. It’s good for your soul and your community. Proceeds earned from registration fees and other donations go to a variety of charitable organizations that partner with each event. Whoever said fitness isn’t fun has clearly never participated in a fun run.